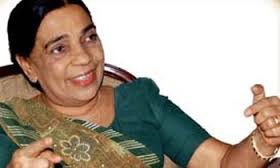 Opposition Leader of the Central Provincial Council and former Minister of Health Renuka Herath passed away yesterday at the Kandy General Hospital. She was 72. Dunuthilaka Mudiyanselage Renuka Menike Herath was born on 07 September 1945. She was a teacher by profession before contesting elections from the UNP. She was first elected to Parliament in 1977 from the Nuwara Eliya District. She held several ministerial portfolios. She was the Health Minister under president Ranasinghe Premadasa. © Copyright (2012) * Lanka Hot News* All Rights Reserved.